Enjoy the outdoor life. Whatever the weather! The Pergotex II Retractable Patio Roof offers full protection from rain and harsh sun without having to leave the comfort of your patio! The Weinor Pergola Awning is water-tight and opens at just the push of a button, extending the living area of your home into an elegant and practical space. With integrated gutters in the front profile, this system will keep you warm and dry throughout the year. Think of it as an extension of your home, a new outdoor room. Easily paired with outdoor roller blinds to fully enclose you from the elements. A unique 7m’s between the upright support posts pushed the limits further than any other on the market! Controlled water flow from the roof to the large gutter in the front profile. By request, dimmable HighPower LED-single spots can be integrated into the horizontal rails for an amazingly beautiful atmosphere. The fabric roof dampens noise during rain showers. The two-part post assembly allows you to choose the height of the water drainage during installation. 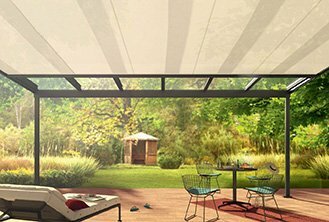 Cassette awning that stands out for its timeless, classic design hand in hand with groundbreaking Weinor technology.